Sqwincher Activity Pack is Ready-to Drink for those needing a quick shot of electrolyte replacement or for the prevention of electrolyte loss. 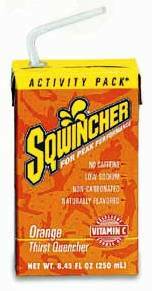 Sqwincher 8.45 oz Activity Drink comes in four delicious flavors and twenty seven (27) packs per case with straw attached to the side of each. Choose from Fruit Punch, Lemonade, Lemon Lime and Orange.